There is a lot to understand about living, working and running a business in Sweden. Regulations are often spread across numerous public agencies making it hard for someone new to Sweden to easily find out important issues that need to be planned for and addressed. The intent of this book is to provide a foundation of this knowledge in one convenient place. 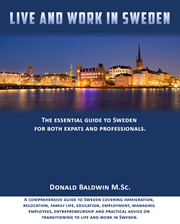 Live and Work in Sweden is also a good reference source for understanding important Swedish concepts. Throughout the book, Swedish language terminology and the accompanying glossary provides a quick reference with English definitions. Case studies are provided to help convey a better understanding of important concepts.